Hey, boys and girls…let´s have a üarty tonigh and this is an excellent soundtrack for such a night ! American Graffiti is a 1973 American coming-of-age comedy-drama film directed and co-written by George Lucas starring Richard Dreyfuss, Ron Howard, Paul Le Mat, Harrison Ford, Charles Martin Smith, Cindy Williams, Candy Clark, Mackenzie Phillips, Bo Hopkins, and Wolfman Jack. Suzanne Somers and Joe Spano have cameos. Set in Modesto, California in 1962, the film is a study of the cruising and rock and roll cultures popular among the post–World War II baby boom generation. The film is told in a series of vignettes, telling the story of a group of teenagers and their adventures over a single evening. The genesis of American Graffiti was in Lucas’ own teenage years in early 1960s Modesto. He was unsuccessful in pitching the concept to financiers and distributors but found favor at Universal Pictures after United Artists, 20th Century Fox, Columbia Pictures, Metro-Goldwyn-Mayer, Warner Bros., and Paramount Pictures turned him down. Filming was initially set to take place in San Rafael, California, but the production crew was denied permission to shoot beyond a second day. A sequel, More American Graffiti, was released in 1979. In early September 1962 in Modesto, California at the tail end of summer vacation, recent high school graduates and longtime friends, Curt Henderson and Steve Bolander, meet John Milner and Terry “The Toad” Fields at the local Mel’s Drive-In parking lot. Despite receiving a $2,000 scholarship from the local Moose lodge, Curt is undecided if he wants to leave the next morning with Steve to go to the northeastern United States to begin college. Steve lets Toad borrow his 1958 Chevrolet Impala for the evening and while he’s away at college until Christmas. Steve’s girlfriend, Laurie, who also is Curt’s sister, is unsure of Steve’s leaving, to which he suggests—to Laurie’s surprise—they see other people while he is away to “strengthen” their relationship. She is not happy with his proposal. Curt, Steve, and Laurie go to the local back to school sock hop, while Toad and John begin cruising. En route to the dance, at a stoplight, Curt sees a beautiful blonde girl in a white 1956 Ford Thunderbird. She says, “I love you” before disappearing around the corner. After leaving the hop, Curt is desperate to find the mysterious blonde, but is coerced by a group of greasers (“The Pharaohs”) to participate in an initiation rite that involves hooking a chain to a police car and ripping out its back axle. Curt is told rumors that “The Blonde” is either a trophy wife or prostitute, which he refuses to believe. Following a series of arguments, Steve and Laurie split, and John inadvertently picks up Carol, an annoying teenybopper who seems fond of him. Toad, who is normally socially inept with girls, successfully picks up a flirtatious, and somewhat rebellious, girl named Debbie. Meanwhile, Curt learns that the DJ Wolfman Jack broadcasts from just outside Modesto. Inside the radio station, Curt encounters a bearded man he assumes to be the manager. Curt hands the man a message for “The Blonde” to call or meet him. As he walks away, Curt hears the voice of The Wolfman, and, having just seen The Wolfman broadcasting, he realizes he had been speaking with The Wolfman himself. The other story lines intertwine until Toad and Steve end up on “Paradise Road” to watch John race his yellow deuce coupe against the handsome, but arrogant, Bob Falfa. Earlier, Bob had picked up Laurie, who is now sitting shotgun in his black ’55 Chevy. Within seconds of the finish, Bob loses control of his car after blowing a front tire, plunges into a ditch and rolls his car. Steve and John run to the wreck, and a dazed Bob and Laurie stagger out of the car before it explodes. Distraught, Laurie grips Steve tightly and tells him not to leave her. He assures her that he has decided not to leave Modesto after all. The next morning Curt is awakened by the sound of a phone ringing in a telephone booth, which turns out to be “The Blonde”. She tells him she might see him cruising tonight, but Curt replies that is not possible, because he will be leaving. At the airfield he says goodbye to his parents, his sister, and friends. As the plane takes off, Curt, gazing out of the window, sees the white Ford Thunderbird belonging to the mysterious blonde. Prior to the end credits, an on-screen epilogue reveals that John was killed by a drunk driver in December 1964, Toad was reported missing in action near An Lộc in December 1965, Steve is an insurance agent in Modesto, California, and Curt is a writer living in Canada (implying that he may be there as a draft dodger). Lucas’s choice of background music was crucial to the mood of each scene, but he was realistic about the complexities of copyright clearances and suggested a number of alternative tracks. Universal wanted Lucas and producer Gary Kurtz to hire an orchestra for sound-alikes. The studio eventually proposed a flat deal that offered every music publisher the same amount of money. This was acceptable to most of the companies representing Lucas’s first choices, but not to RCA—with the consequence that Elvis Presley is conspicuous by his absence from the soundtrack. Clearing the music licensing rights had cost approximately $90,000, and as a result there was no money left for a traditional film score. “I used the absence of music, and sound effects, to create the drama,” Lucas later explained. Okay ..let´s start the party ! 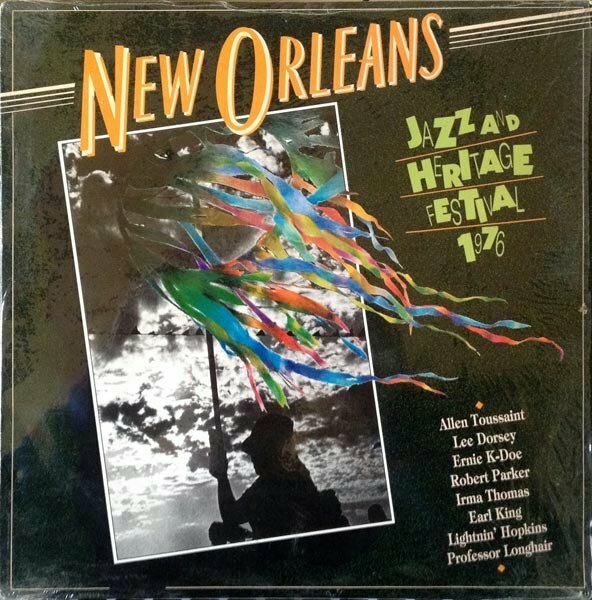 Once a year, during the New Orleans Jazz & Heritage Festival, some of the greatest artists the Crescent City has to offer get together to revel in their colourful past and give fans a sample of what’s in store for the future. 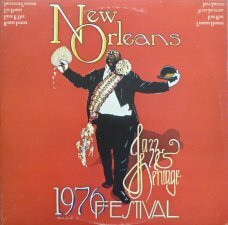 The 1976 Jazz & Heritage Festival was no exception to this tradition. The music contained within is not only indicative of the time it was recorded but also transcends time by affecting the popular music being produced today by bands like Galactic. Most of the tracks on this album were recorded on April 9, 10, and 11 at the R&B segment of the festival. 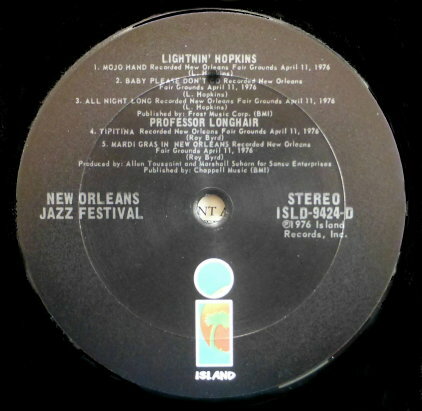 The album contains performances by jazz progenitors and New Orleans greats such as, Professor (‘Fess) Longhair, Allen Toussaint, Irma Thomas, Lee Dorsey, Ernie K-Doe, Robert Parker, Earl King, and Lightnin’ Hopkins. In 1989 this album was re-rleased by Rhino Records with a complete different cover and artwork. Tracks 1 to 5 rec. on riverboat “President” 9/4/1976. Tracks 8, 9, 12 to 14 & 17 to 21 rec. New Orleans Fairgrounds 11/4/1976. Tracks 6, 7, 15 & 16 rec. Sea-Saint Recording Studio 11/9/1976. Tracks 10 & 11 rec. Sea-Saint Recording Studio 26/9/1976.